If all the "bricks" in the stack shown are identical to one another with a single brick having a circumference of 345 units ( section view), what is the circumference of the whole stack? There are two categories of shared edges: vertical edges and horizontal edges. * vertical edges: there are 27 edges shared by two bricks. The length of their shared edges is 27H, where H is the unknown height of a brick. (b each of the two rows extends beyond one end of the other. The amount of shared edges = length of shorter row minus 2* overshoot. In this picture, the relationships are (2-3, 6-7, 4-5), so the sum of the shared regions is 12L-2x-2y-2z. The total shared horizontal edges are 31L -2(x+y+z). This would be so neat, if x+y+z = 2.
then the total would be 36 (345) - 27(2L +2H) = 36(345) - 27(345) = 9(345), and we wouldn’t have to know H or L.
Shifting all the bricks either to the left or right , one can see that there are 18*L and 18*H, i.e. 9 pairs of L+H. Thus, a quick way to check the answer without having to know the actual L and H values! lets look at the two- brick and three- brick interface. The shared horizontal space that needs to be subtracted is 2L - 2x, where x is the amount of overhang. So the perimeter of the combined (2-brick plus 3-brick) assembly is 5*(2L + 2H) - 3*(2H) -2L (2-x). This changes as you slide the ends together, so it looks to me that sliding the bricks alters the total perimeter. Ed, you've got the answer correct and I'll duly mark yours as best answer. You mathematically came up with 9*345, which also holds for the shifted bricks. Shifting doesn't change the total perimeter (circumference) as the bricks stay in contact and no space is added in between any of them along a horizontal line. I agree with Ed. Sliding changes the perimeter. You mentioned the bricks stay in contact but your shifted bricks have more contact. 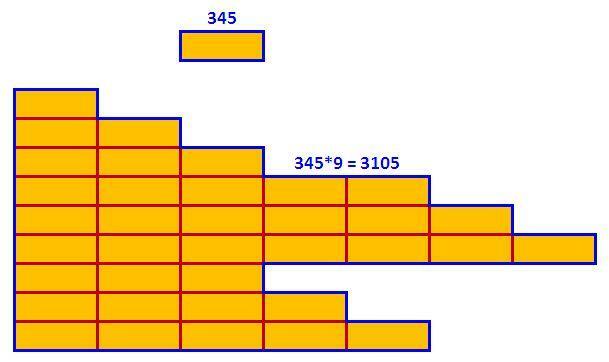 If you only had the top two rows of your shifted bricks, the circumference is 2 bricks (4L+4H). But once that top brick starts to slide over the edge of the two below it, the perimeter increases. Let's say exactly half the single brick is in contact with the the row below with the other half hanging over. You now have 5L+4H. I've outlined the perimeter. Each of the green lines are L. Pairs of blue lines should be L since the edge of the row it touches is entirely in contact (no overhang). Pink lines are H. Yellow lines are sections I haven't been able to put a value to. So 13 green lines =13L. 5 pairs of blue lines=5L. That's 18L right there and the yellow lines are unaccounted for. With the 18H, you've got 9 bricks plus what looks like about another L.
Sad to say that things don't work out when one is dealing with "overhanging bricks" at the start.One has to have an eventual stack that's "growing" downward, or at least, the number of bricks in a row should equal the number of bricks above (or below) it. The bottom line is ... when the number of Ls don't match the number of Hs, it's not possible to find an answer. I now fully agree that it is certain that the perimeter can change when shifting bricks and I duly apologize to all. Sorry guys, I should've chosen a "better" stack layout! Still hats off to the Captain for his effort and Thalia for her input. @Moderator, please declare this question null and void ... everything did look perfect when I posted it! Rocdocmac, I found it to be interesting, and I felt I learned something while attempting to solve it. Also I was impressed at the originality of the problem. Thanks! Thalia, thanks for showing us that I wasn’t crazy! A bit late now, but here's a revisit. I told you that I could have chosen a "better" stack! Here's one that actually works. It contains overhanging of bricks, but shows that shifting does not necessarily alter the perimeter. No more yellow segments, Thalia! Alright! I think the important thing is that the overhang is on both sides. Not just one side with the next row sticking out from the first.